The one piece Up and Over garage door has been the most popular type of garage door in the UK for so many years. The simplicity of operation and diversity of panel design is one key factor. Up and Over garage doors can be a standard size or made to measure if extra width or height is required to optimise the drive through sizes. 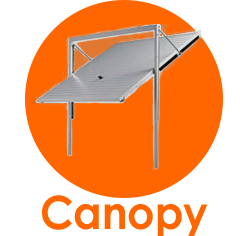 They are available in steel, timber, Upvc and GRP in various different designs and finishes. Many designs incorporate windows for light and visual appeal. The information below demonstrates some of the differences between the two different door mechanisms. The canopy gear is only available in doors up to 2438mm (8 feet) wide, all doors wider than this use retractable gear. The retractable garage door is fast becoming the more popular type of garage door mechanism of the two in the UK, its name derives from the garage door panel retracting fully into the garage when open on horizontal tracks. It is the mechanism that will convert easily and safely into electric operation with the least equipment involved. A canopy door gives the maximum drive-through width when open and is the easiest door to install. The door panel is balanced and assisted in operation by torsion springs that are positioned above the door panel on the head of the fixing sub frame; this is then lifted by steel cables on either side of the door, attached to wheels running in a channel. The drive-through width on a retractable mechanism is always reduced as the lifting arms at either side sit between the sub-frame when the door is opened. Be careful that you do not compromise your vehicle access too much when limited for opening width. There are options such as the Retractable Plus gear from Hormann's doors which tackles this problems on doors up to 7'6" (2286mm) wide. 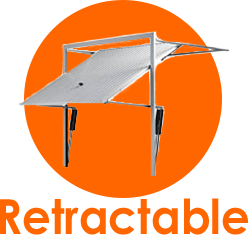 The retractable door mechanism can take much heavier loads, with the adjustable tension springs at the sides easily increased in size and strength. Note: Retractable operating gear is generally used for garage doors over 8 feet wide and heavier door panels such as hardwood-built doors. All double width garage doors have retractable operating gear only. In addition to the simple, standard canopy and retractable doors, there are also another couple of up and over door options available for slightly more specialist applications. 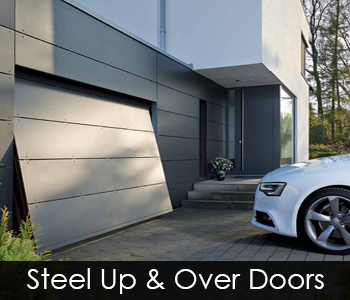 The Silvelox range of up & over garage doors use what is effectively a canopy type operation, but the door is operated via weights either side to counterbalance the door panel. The use of this method means that the doors are available up to very large sizes, all with the same operation method. 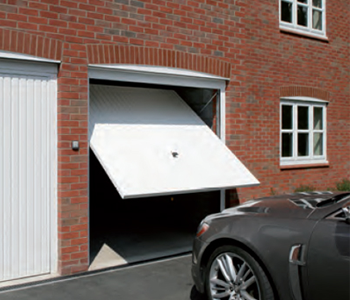 This is a great option where a canopy type operation is required on a larger sized door, and perhaps if there are any restrictions inside the garage.The Silvelox doors themselves are very high quality timber construction with unique options like the wicket door inset into the main panel, an option taken by most people looking at these types of door for convenience, especially in mews type houses or where the garage isn't used for a vehicle but accessed frequently on foot. Whilst we have talked about Canopy and Retractable doors, there is another specialist door type manufactured by Silvelox - the Securlap. The Securlap is a two-piece door system, using counterbalance weights to lift the two panels vertically. This door type is unique, as there are no internal tracks required; perfect for limited space installations. The door panels are all double skinned and insulated as standard, with excellent levels of security. This is a bespoke door system, offering sizes in 50mm increments in width and height, with a vast array of panel designs and finishes. An alternative door types in manufactured by Hormann, and is a one piece up and over mechanism originally used for high volume car park access with many operations per hour, alternatively known as a ‘collective garage door’. The Hormann ET500 is a very string and durable construction offering several standard options for the main panel but with the added benefits of a model which can be infilled with whatever you require as a material to match or compliment existing features on the building. The ET500 ‘open for infill’ will enable the use of heavier timber infills such as Oak and will offer the very highest levels of durability because of its background as a multi user door. The Up and Over garage door is still the most versatile when it comes to different materials and designs. The one-piece panel structure means that doors can be manufactured from a range of materials including steel, fibreglass, UPVC and most types of timber. 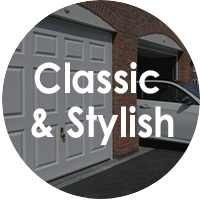 We have designed and manufactured many wonderful bespoke timber garage doors over the years, along with some very large steel and GRP doors. More recently however the maximum available width of a one-piece Up and Over garage door has reduced, due to stricter safety legislation. As a result, the Sectional garage door has stepped in for larger garage door sizes. Economically, steel is still the most cost-effective choice of door panel material. The choice of timber species is the most varied with Up and Over doors. Some doors offer Cedarwood, Idigbo, Oak, Accoya, Hemlock or Nordic Pine as standard with other more exotic timbers also possible, depending on sizes. 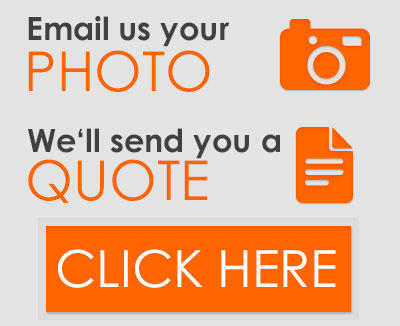 Consult our product catalogue section, and select from different material types. When discussing measurements for Up and Over doors we always use the dimensions of the internal fixing sub frame, and these dimensions are generally the ones used for ordering. The sub frame is the frame that is installed into the opening, which the door panel and mechanisms are attached to. This frame can be box section steel or timber as standard from most manufacturers. For example, a 7'x7' (2134mm x 2134mm) garage door ordering size refers to the internal size of the sub frame, with the door panel itself being smaller within. Sub frame dimensions can vary slightly depending on the mechanism chosen, which may affect your overall ordering dimensions. Up and Over garage doors with sub frames can be installed inbetween (reveal fitted) or behind (inside) the opening, but not in front of it. The installation position can depend on sizing restrictions, but more commonly comes down to aesthetics and personal taste. Fitting behind the opening can increase the drive-through dimensions, which may be the difference between storing a vehicle in your garage or not. If you are unsure please contact us; we're happy to help. Installing in-between the opening means you see the full frame and door and can position the door wherever looks best or works for the floor levels; it may appear better to some, but obviously means a smaller door size. 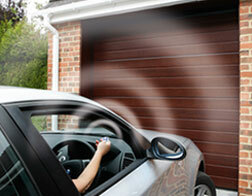 All new Up and Over garage doors can be automated through the use of a ceiling mounted electric operator. 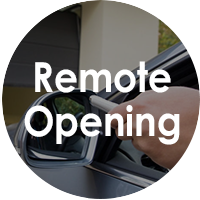 Remote controls make automated automatic entry the ultimate convenience for your garage door, at just the press of a button. For Canopy gear doors a bow arm converter is required if a traditional boom operator is installed, although not all canopy type doors are able to have this retrofitted. Automation is always much easier with a Retractable Up and Over door, since the bow arm is not required. Unfortunately, automation is not compatible with all Up and Over doors, which our team of experts will be able to advise. Remote operation is secure, using hi-tech encryption systems between the remote and the receiver. 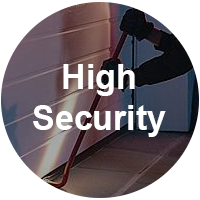 Security is a high priority for many households, particularly with valuables and vehicles stored in garages regularly. Whilst Up and Over doors are secure, with 4-point locking available on a number of our doors, there are a selection of doors built with security as the top priority. The Garador Guardian range of high security and insurance rated garage doors has reinforced steel bracing on the inside, steel plates at critical attack points and 4 point locking all as standard. The door is independently tested and approved to Level 1 by the LPCB and is a ‘Secured by Design’ approved product. 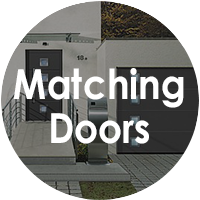 If you want to match your garage door with your entrance door, then there is a range of matching doors from Hormann. These doors are manufactured in either single skin or double skinned steel or timber, and are designed to complement each other aesthetically in a range of practical standard and purpose made sizes. 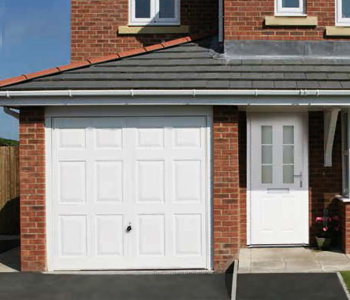 Garador also offer a range of single skin steel side doors to match their Up and Over doors. For additional technical information on these doors, go to our specialised up & over doors technical information page. Simply follow the button below to find out more about gear types, automating doors and up & over sizing information.